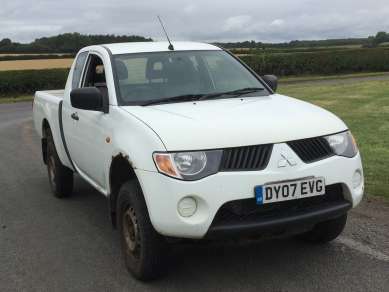 APRIL 2007 MITSUBISHI L200 2.5 Did 4X4 4 WORK CLUBCAB PICKUP, WHITE, 59,150 MILES, RADIO/Cd, STEEL WHEELS with 205/80R16 Tyres, TOWBAR. MOT 26th APRIL 2019. SERVICE HISTORY.